In SprutCAM the work on building the project technology begins with selection of a machine tool which the part will be manufactured with. The type of the machine and its parameters define the list of available operations, the operations capabilities, the default parameters, as well as the subsequent behavior of the system. For example, if a lathe machine is selected, then only turn operations are available, for a mill machine there are only mill operations available, while for a mill-turn center are both turn and mill operations available. Selecting a five-axis mill machine makes it possible to indicate position of rotary head in a number of 3D operations, and so on. To change a machine one need to select the root node in the machining tree, than press the <Parameters> button. The dialog that appears contains a list of available machines at the left and the machine property editor at the right. The editor displays properties of a selected machine, which can be manually edited. The <Machine name>, <NC system name>, <Developer> and <Commentary> fields are filled by the machine scheme developer. The <Postprocessor file> field specifies the name of the postprocessor, which will be used to generate CNC code by default. In the <Tool library> field one enters the name of a tool library which the tools for operations will be selected from. 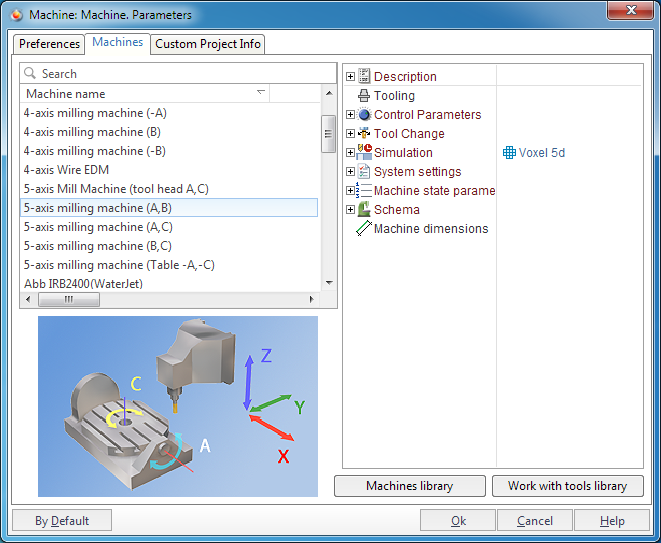 This library is used both by automatic tool selection and by defining the tool manually via the operations parameters window. The group called <Control parameters> contains settings for a used control. Here <Tolerance> (Digits) determines the number of digits after decimal point to output in CLDATA commands. Furthermore, a generated toolpath will not contain tool movements shorter than the specified tolerance. If the <Use arcs> box is unchecked then a generated tool path will contain only linear movements. If the box is checked, then arcs in selected planes will be generated, but only those, whose length is greater than the specified <Minimal arc length>, and whose radius is less than the specified <Maximal arc radius>. All other arcs will be approximated with lines. The fields from <Tool Change> group contain coordinates of the appropriate points that will be used by tool path calculation. The <Scheme section> defines the configuration of the used machine as well as availability of machine components such as index tables, rotary heads and other. A machine is described as a tree of components, moving relative to each other. The root node <Scheme> corresponds to the machine base. The machine elements mounted direct on the base are listed under this node. Each node can contain sub nodes – the components, mounted on and moving relative to the parent. The leaf nodes of the tree have to be either a workpiece or a cutting tool. The way and direction the component moves is described in the fields <Axis Type> and <Direction>. The axis type can be either linear or rotary. For rotary axes the <Direction> defines orientation of the revolution axis. The <Address> field specifies a prefix, by which the component is addressed in an NC program. The <Min> and <Max> fields bound ranges of available element movements. The <Point> field defines coordinates of the point in the machine coordinate system which the node axis passes through. It is possible to change the points and the axes directions of machine components. If none of available machine types does not suit your needs, turn to your dealer or to the service team for a help.